If you need information on the hardware and software that is installed on a computer, the Belarc Advisor from belarc.com is a free tool (look under Free Download on its website) that identifies a Windows computer’s hardware (motherboard, graphics card, hard disk drive(s), DVD drive, etc.) and software (version of Windows, applications, etc.) and even software licence keys, including the Windows Product Key, which is always required when reinstalling Windows, including Windows 10, which is a free upgrade for Windows 7 SP1 and Windows 8.1 PCs until the end of July 2016. Technical documentation – guides and user manuals – are usually provided as PDF downloads (requiring a free PDF reader) from the graphics-card or motherboard manufacturer’s website. The PDF downloads are usually 6MB+ in size, so can take a while to appear in your computer’s PDF reader. (Creative provides online user guides for its sound cards.) An example is the Catalyst Control Center User Guide. The device drivers for AMD’s Radeon graphics cards (GPUs) and APU processors that provide integrated graphics are obtained from amd.com (in Sept. 2015 under Drivers and Support) and are called Catalyst drivers. The download installs the Catalyst Control Center that provides the settings and other options for the graphics card using the drivers. Most users only need to know the make/model, shown under Name (to be able to download its latest device drivers from the manufacturer’s website), DirectX Support – the highest version that the graphics card supports (Windows 7 & 8.1 requires a graphics card that supports a minimum of DirectX 9.0c – important if you are upgrading from an earlier version of Windows, such as Windows XP), the Bus Interface (PCI, AGP, PCI Express) and the Memory Size (1024MB = 1GB in this example). Note that ATI is now called AMD, having been purchased by AMD, which means that AMD and Nvidia are now the two major manufacturers of graphics chips. According to Microsoft, Windows 10 requires DirectX 9 or later with WDDM 1.0 driver. Every graphics card or graphics chip integrated on a desktop or laptop PC’s motherboard installs a display control panel when its device drivers are installed that adds to the display options provided by Windows XP, Windows Vista and Windows 7/8/1 &10. It will either be an independent control panel, usually added to the main Windows Control Panel, or be added to the Display Properties feature in Windows that is accessed from its main Control Panel. For example, to access the graphics chip manufacturer’s control panel in the laptop PC I’m using to write this, which has its graphics integrated on the motherboard instead of as a separate graphics card, I have to open Display in the Control Panel (Windows XP/Vista/7/8.1/10) or right-click an empty space on the Desktop and click Properties. With the Display Properties window on the screen, click the Settings tab to open it and then click the Advanced button. The image below is the window that I get. The top tab called Intel Graphics Media Accelerator Driver for Mobile gives access to the laptop’s integrated Intel 945GM graphics control panel, which allows me to change the colour-correction settings – brightness, contrast, gamma, etc. The image below shows how the Intel 945GM graphics chip appears in the Windows Device Manager. Both entries are required because they provide different functions. To uninstall the graphics adapter, both entries have to be uninstalled. A double-click opens the window showing each entry’s information and options. A right-click on each entry allows you to update the driver and disable or uninstall the graphics adapter. If you uninstall the graphics adapter, Windows reinstalls the device drivers the next time the computer starts up or is restarted. Just doing that fixes many graphics problems. Alternatively, you can download and install the latest drivers from the display-adapter manufacturer’s website. The control panel of a separate graphics card, now mostly installed in a PCI Express x16 slot on the motherboard, usually provides several more control settings and sometimes even troubleshooting options. 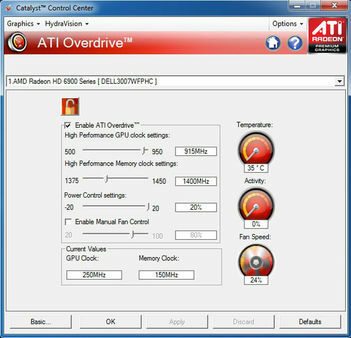 The image below shows the Catalyst Control Center (CCC) for an ATI Radeon graphics card, now called the AMD Catalyst Control Center since AMD acquired ATI . A high-end graphics card has its own memory and fan to keep the main GPU chip cool, which a graphics chip integrated into the motherboard of a desktop or laptop PC does not usually have, hence the options for memory-clock settings and fan control.